Understanding the contracting chain on cell tower jobs can be complicated, but crucial when workers die. William “Bubba” Cotton, 43, was the first of 11 cellsiteworkers who died on AT&T projects from 2006 through 2008, years when the carrier merged its network with Cingular and ramped up its 3G network for the iPhone. As ProPublica and PBS “Frontline” reported last month, tower climbing ranks among the most dangerous jobs in America, having a death rate roughly 10 times that of construction. The project Cotton was on involved several layers of subcontractors, which is common in the tower industry. The accident was more unusual. Most of the 50 tower climbers killed on cell site jobs since 2003 have died in falls, but Cotton was crushed to death by an antenna. A wrongful death lawsuit subsequently filed by Cotton’s survivors, as well as a personal injury suit filed by his cousin and co-worker, Charles “Randy” Wheeler, explored two questions at the heart of every tower fatality: Who controlled the tower site? And who was responsible for the safety of the subcontractors working on it? via Anatomy Of A Cell Tower Death · OPB News. The AT&T cell tower job in which William Cotton died involved several layers of subcontractors. 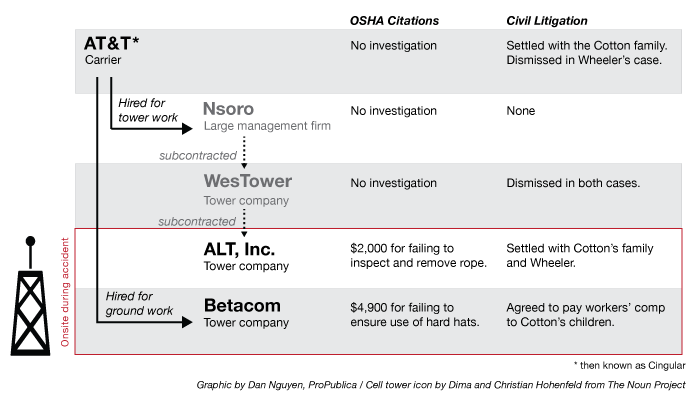 This chart shows which companies in the contracting chain were investigated by OSHA and the results of litigation by Cotton’s family and his co-worker, Charles Wheeler.